have you ever noticed how dry vegan baked goods are? no dairy, no eggs will do that to a sugary confection. 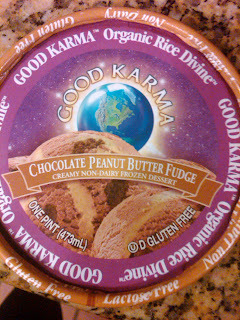 Good Karma foods makes this amazing ice cream and it has vegan brownies in it- aka wet chocolate powder that is packed together. even though the brownies are awkward, this is probably the best ice cream i have ever had! no joke! its chocolate, has peanut butter swirls, and the weird powder brownies. today i had probably the third worst morning of my life and once i finally got home i finished off half of the pint. at least i am able to find comfort foods as a vegan. this brand's ice cream is USDA Organic, Lactose Free, Gluten Free, Non Dairy, Trans Fat Free, Vegan, Supports Green Farming and amazing!